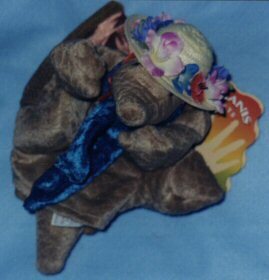 An armadillo hand puppet dressed with a hat and scarf. Please note that the hat and scarf from the hand puppet can be purchased separately. Note: Colors may vary from picture. When the winds of a Texas "blue norther" bend cactuses to the curves of the desert hills, Miss Billie Armadilly decides to make a pot of chili.